Keeping Your Balance | Tennessee Aircraft Services, Inc. Probably not as accurate but to get the point across in fewer words by Paul: Flutter (airplanes) – If the airplanes’ airspeed exceeds the design limit, it is susceptible to generating oscillations that can rip the plane apart with you in it. Generally, we all believe if flown within its designed limitations our airplane won’t experience flutter. That security is also based on an airframe maintained within its designed limitations as well. Out of balance flight controls change all the rules. I really don’t want to talk about flutter. It’s a very complicated subject with many variables including the natural resonance of the wing structure and the study of vibration. Vibration is one of those mechanical engineering classes capable of consuming far better students than I. One major deterrent to control flutter is properly balanced flight controls. Balancing stuff only requires basic mathematics so I can talk about that. A 152 left elevator sitting on angles for balance check. We used what ever we could find laying around the shop to create mandrels. Masking tape applied for making distance marks from the pivot line and protecting the paint from getting scratched by the weights. Most all of Cessna’s aircraft service manuals contain information on balancing the controls of that airplanes’ flight controls. Some of the older planes don’t so Cessna generated Service News Letter 86-44 (SNL86-44) with detailed information for those planes. All of the ailerons, elevators, and rudders of our Cessnas are required to be balanced. The procedure is simple; support the flight control on its pivot points horizontally and measure how much and where weight must be added to allow it to balance. 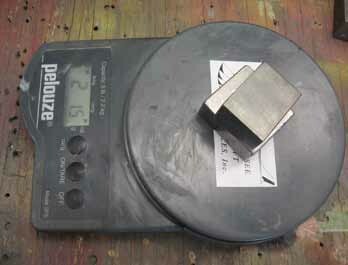 Our goal is to determine if the the added inch pounds are within the allowable tolerance. To do this we could purchase Cessna’s balance tool kit p/n 5180002-1 which cost $1654.00 in 1986 but amazingly only cost $990.00 today. Cessna even keeps them in stock. Many years ago I fabricated my own using the drawings provided in one of the airplane service manuals. It doesn’t take much imagination to realize a simpler way is available. One only needs a couple of narrow supports for the control hinge points, a precise postal scale, and a selection of weights. We begin by setting the flight control on a pair of mandrels using bolts in the controls hinge points. The mandrels must be level so the hinge bolts won’t try to roll down hill. The mandrels must be built in such a way it won’t touch the control thus preventing free movement when near level. The area chosen for this process should not be breezy including any air movement from the shop fan. It doesn’t take much force to move a light weight control teetering on pivots and thwart attempts for a consistent balance. Most flight controls will be under balanced. This means more weight is needed forward of the pivot line to make the control balance. In contrast, overbalance would be excess weight forward of the pivot line. All we need to do is pile enough weight at a single point on the control that causes it to balance in a level state. A place must be found on the control where the weights will rest evenly. Another method to add weight is to hang a small bucket from one of the tooling holes in the flight controls’ balance horn. Water is slowly added until the control is balanced and level. A couple of tungsten bucking bars centered on the 6 inch mark and the elevator steady in the level position. This is a two man/women job to catch the elevator WHEN it accidently falls off the mandrels. The weight is placed on a nice quality letter scale and measured. A distance measurement is taken perpendicular with the hinge line from the weight to the pivot line. When recording the weight and distance be sure to use the same units as used in the service manual to describe the balance limits. The balance limits for flight controls on legacy airplanes are usually found in the Structural Repair section of the service manual. I almost always look in the service manual section labeled for the control I’m working with and the information is never there. If you don’t find the balance information needed in the Structural Repair section it will likely be found in SNL86-44. Now we have the mathematical components needed for balance calculations. For the sake of discussion, lets say you have your 152 right elevator repainted and need to check its balance. 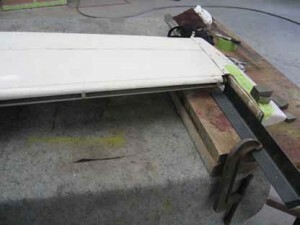 The elevator is placed on the mandrels with the trim tab and trim tab arm attached. Use a few small pieces of tape to hold them in a neutral position. You stack 48 ounces of scrap tungsten bars on top of the balance horn of the rudder precisely 6 ½ inches forward of the hinge line. Anticipating the service manual uses pounds we convert the 48 ounces to 3 pounds. The overbalance calculates as 6 ½ inches times 3 pounds for a moment of 19.5 inch pounds. The 2 tungsten bars on the scale for weigh in. To find out if we can mount the elevator on the plane and have it signed off as airworthy, we need to know the limits. Go to the service manual section 8 for Elevator Control System and….. it’s still not there! Move on to section 17 for Structural Repair page 17-19 figure 17-3 in the table and find the right elevator balance limit is from 0.0 (balance with no added weight) to a maximum of 19.52 inch pounds of under balance. We are 0.02 inch pounds inside the limit and good to go. If the balance had fallen outside the limits you’d have to either remove or add weight from the big chuck of lead mounted in the horn of the elevator. Removing excess weight from the permanently mounted lead is as easy as drilling a hole in it. Adding weight could be as simple as putting extra washers under the heads of the weight mounting bolts. It could also require a torch to melt some extra lead into the existing piece. Playing with fire is outside the scope of this article so we’re happy yours is within tolerance. The balance of a flight control doesn’t change appreciably in the normal use and aging of a plane. 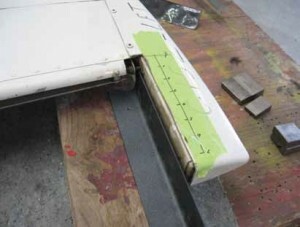 However, anytime repairs are made to a balanced flight control or it gets repainted, its balance must be rechecked. I recommend checking the balance of a control before work is performed as a reference point. I’ve found plenty elevators outside the balance limits and they were still dressed in their original factory paint. If your flight controls get repainted or repaired, there must be documentation of a balance check in the permanent aircraft maintenance records. This document must be signed by an FAA certificated airframe mechanic or a certificated repairman on an FAA certified repair station work order. Of all the simple maintenance items one might want to ignore, this is not one of them. No documented balance check is an invitation for denied insurance claims and in the truest sense, makes the plane unairworthy.